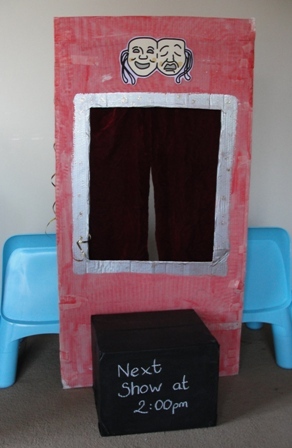 Sun Hats & Wellie Boots: When is a box not a box... when it's a Puppet Theatre! 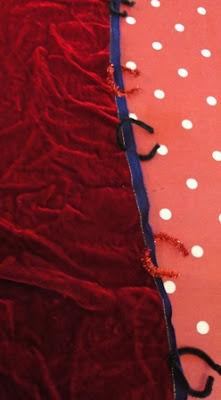 When is a box not a box... when it's a Puppet Theatre! You may have already guessed I have a penchant for cardboard boxes! 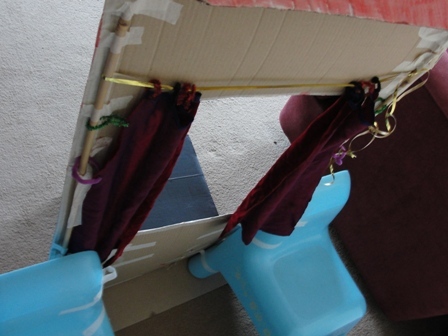 So many imaginative play opportunities can unfold from a recycled cardboard box. With large cardboard boxes we've already created a Baker's Shop, Post Office, Tepee, a rocket, slide, houses, boats & a bus! 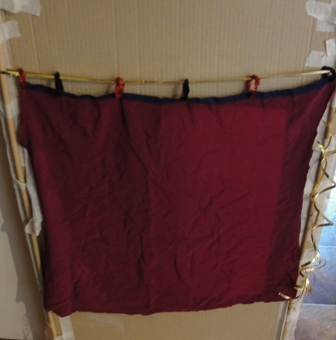 Minnie has been totally absorbed in puppet play recently, so we thought we'd create a Puppet Theatre. This box has previously been a post office & bakers shop. 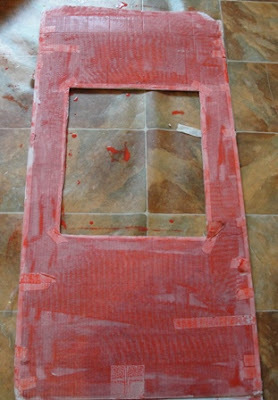 Minnie gave the box a coat of paint & we added some silver paint & glitter to decorate. 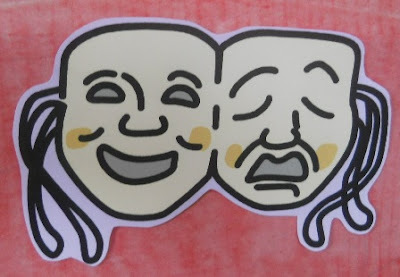 For the finishing touch we added some comedy & tragedy masks. Two hands are so much quicker than one! To secure the box we taped a couple of garden canes to either side & added two small plastic chairs. The chairs offered a neat place for Minnie to sit while she put on her puppet show & an area to store all her puppets & props. 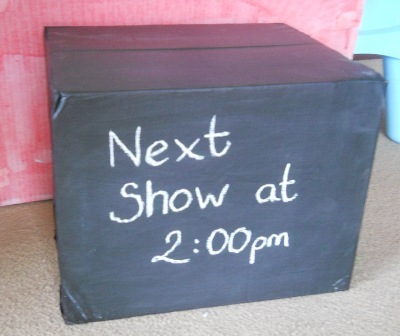 Our chalkboard box made a great signboard, & provided a ledge for puppets/props to sit on. 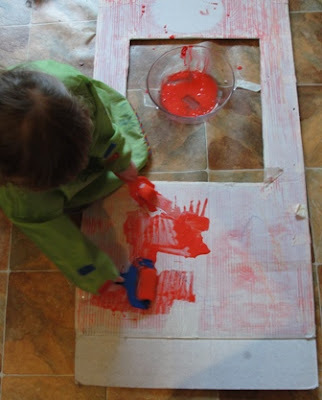 Offering a simple space like this has been great for encouraging more imaginary play. Minnie has been in complete control of her play, deciding when performances begin & end by opening/closing the curtains, added characters, dialogue, different voices, emotions, props, & songs! It's been great to see how she's manipulated the puppets; they have appeared from the 'window' of the box, popped over the top of the box & even been hanging from the curtain pole (like her homemade octopus below). Minnie’s selection of puppets included her homemade sock puppets, owls, & speckled frogs, along with some she made to accompany a Rainbow Fish storybook. She also independently made another set of puppets. 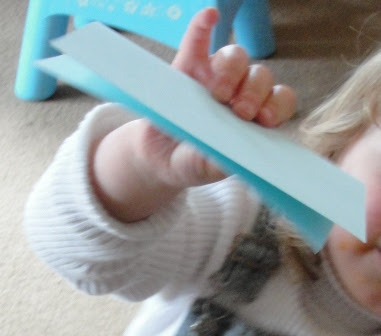 These were A5 sheets of paper that she had folded in half, she then placed the paper in her cupped hand to create a talking puppet. Genius! I'm a huge fan of puppets & how they can empower children. With a puppet a child can be fully engaged in imaginative play; creating fantasy worlds as well as exploring the world around them. They can explore & act out a range of emotions, identities & situations, some of which they may not have been otherwise able to do so. 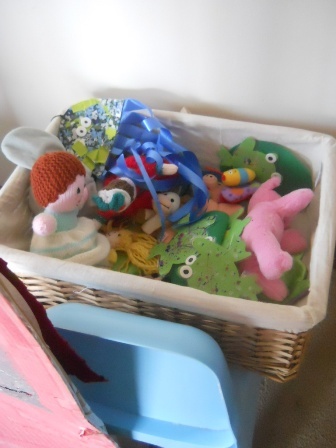 Having a selection of puppets that children can easily access also offers free unstructured play opportunities, a chance to explore language, problem solving, fine & gross motor skills, social skills such as turn taking, & freedom to follow personal interests. Observing Minnie has reinforced my belief that puppets don't have to be that elaborate or expensive. 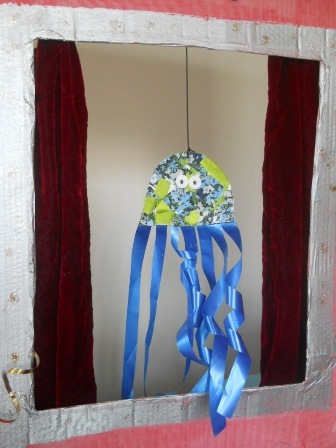 By simply offering a range of different materials, children can create some amazing puppets which allow so much imagination to flourish!